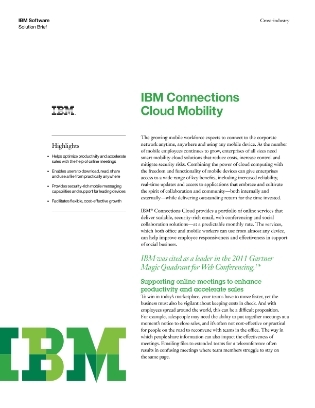 As the mobile workforce continues to grow, enterprises of all sizes need smart mobility cloud solutions that reduce costs, increase control, and mitigate security risks. Combining the power of cloud computing with the freedom and functionality of mobile devices can give enterprises access to a wide range of benefits, including increased reliability, real-time updates, and access to applications that foster collaboration. This white paper introduces one company’s portfolio of online services that deliver scalable and security-rich email, web conferencing, and social collaboration solutions at a predictable monthly rate. Read on to learn more about these services, which can be accessed from almost any device and can help to improve employee responsiveness and effectiveness in support of social business.